This classic Springsteen song from the Nebraska album went running through my head this morning. Now it’s true that America has always had some significant number of folks barely scraping by–Bruce wrote this 30+ years ago when we were passing through a nasty time with steel mills and factories shutting down all over the country–but seeing news reports showing that one in two Americans are poor or low income makes me think this country has turned a corner. We’re in a bad place, people. On one end of the spectrum we get the Occupy movement and on the other the Tea Party. Both are fueled by the disparity in income and outcomes, though I like to think one is backed by love and optimism while the other by hate and fear. When Bruce wrote Johnny 99 the average CEO made 40-50 times what the average worker at the same company earned; today the difference has increased an order of magnitude, to 450-500X and this is simply not sustainable. Most Americans, naively as it turns out, thought that this could be dealt with through the political process. The two parties would balance each other and in the end act in the best interests of the majority. The two movements are recognition that we’ve been naive and that the political process has been captured by Wall Street and other massively wealthy families. How else do you explain Barack Obama’s actions in supporting ACTA, SOPA, NDAA and the unconstitutional use of police powers as well as his administration’s unwillingness to hold individuals criminally liable for the many acts of corporate fraud behind huge ‘settlements’ the SEC and DoJ have made? (b) have been distracted by the bread and circuses of false crises spread through modern media, Twitter and Facebook. But there’s a limit to how long these two factors will stand in the way and I think we’ll reach it all too soon. The ultra-wealthy are unwilling to be discrete. From apartments selling for $88 million to baseball players getting $250 million dollar contracts to the ridiculous antics of the Kardashian family, well, a father seeing this crap and then looking at a wife and baby he can barely afford to feed all sleeping in a beat up old car isn’t going to be too far from deciding some people have too much money and some not enough. The Tea Party have taken a smart approach, much smarter than I’d have expected. Copying tactics from a previous generation of Republican activists they worked from the bottom up, getting control of local and regional party organizations before the national leadership noticed it. From there they got the likes of Michelle Bachman into Congress and into the Republican Presidential field as a candidate to be taken seriously. Which strikes me as an amazingly good job considering that Bachman is, after all, a complete nut. The Occupy movement is eschewing the mainstream political arena entirely, recognizing that beyond having been co-opted by the money and drug-like high afforded national politicians the process itself cannot in any reasonable amount of time deliver the necessary changes. This is demonstrated by the widespread use of riot police to suppress Occupy camps and marches with the police action coordinated at the Federal level. Which is, sadly, another way that Barack Obama has disappointed many of the people who supported and voted for him. Then throw in the onrushing climate change disaster, the looming nuclear threats from Iran, North Korea and Pakistan and the inability of manymost people to see the 18 wheelers running straight at them. Where this will all end I can’t say. If any of the Sad Sacks who comprise the current GOP field beat Obama next November I think we’ll find out sooner rather than later but even the re-election of Obama is unlikely to defer for long a violent and sad future for many Americans and our companions on this small globe. At least I get to listen to Bruce for as long as the power grid lets me keep a charge. The corporation is one of the greatest intellectual innovations, enabling activity on a scale otherwise impossible and, I’m convinced, leading to technical and social developments centuries faster than would otherwise be possible. Historically one of the great aspects is that liability is limited to the corporation and its assets, enabling entrepreneurs and investors to take risks building new technologies and exploring new geographies, from the Erie Canal to Hollywood to Silicon Valley. But the corporation is not a Platonic Ideal, perfect in conception and required to be unfettered by restriction. Corporations are a tool conceived by and composed of imperfect humans and subject to all the fallibilities of same; how we organize and regulate must and should evolve as circumstances and our understanding change. So today I assert that the time has come to reduce the liability shield corporations afford its executives. When companies pay multi-million and multi-billion dollar settlements in criminal investigations and civil suits the executives responsible must pay a personal price. After all a corporation doesn’t build a plant that dumps toxic waste or decide that some securities are so solid that insuring them is literally without risk, humans who work for them do. Matt Taibbi, I think, pointed out that since its founding in 1869 the US Government has bailed out Goldman Sachs 14 times and the companies innovations have lead directly to the last five major recessions/depressions. But no Goldman Sachs executive has gone to prison or suffered much more than a (slightly) reduced annual bonus. In 2008 we–the American taxpayers and, to be fair, the Chinese and other foreigners who buy our government bonds–put trillions of dollars into Goldman Sachs, AIG, Citi Bank and the other large financial companies so our economy wouldn’t collapse. These banks were “too big to fail” and the people in government and on Wall St who make such decisions turned on the cash firehose. What the powers did not do, though, was rectify the problem of them being too big to fail but made them even bigger by merging, for instance, Citi with Merrill Lynch and JP Morgan with Bear Stearns. What they also did not do is bring criminal charges against any executives responsible for such horrendous decisions. Even when independent investigations by ProPublica and others uncovered massive illegal activities in the Magnetar and Hudson Mezzanine offerings, billions of dollars of outright fraud, when the investment banks paid hundreds of millions in fines and restitution, not a single executive at Goldman Sachs or JP Morgan was held personally responsible. When a company agrees to a settlement, criminal or civil, of more than $50 million or 10% of annual revenues in the year the actions in question took place (or the last year, when multiple years) the CEO and two other executives most closely involved in approving the actions are to be held personally accountable. At the very least they must pay a fine equal to their total compensation for any year in which the actions occurred and depending on certain criteria which I’ll leave unspecified here the fines increase to 150 or 200% of that amount. If the settlement is over criminal actions (e.g., SEC, FDA, etc. investigations) then the executives should also serve jail or prison time equivalent to a Class A felony. Would such changes make companies far less likely to settle investigations and lawsuits? Of course but if the evidence, as in the Goldman Sachs/Abacus case is strong enough to command a $550 million dollar fine I expect its strong enough to win a conviction. After all, corporations are increasingly claiming all the rights of real people as in Citizens United and other children of Southern Pacific Railroad vs. Santa Clara County. They should suffer the same consequences if they do wrong. Frankly I think this is one change the folks involved in Occupy Wall Street and the Tea Party ought to agree on. Comcast: Cut the BS on Fox Soccer in HD and just answer already! I’m getting fed up with the BS line the customer service people are told to give as an answer when I call to ask why I have to pay extra for Fox Soccer Channel and GolTV. I was told, after waiting ONE FREAKING YEAR since my last call, the same BS: that Comcast cannot carry these channels in HD because the networks won’t allow it. Fox, of course, says that they’d be happy to have the ONE OF THE TWO LARGEST CABLE COMPANIES IN AMERICA carrying their network. Clearly one company is not telling the truth. Given that Fox can only gain from carriage the logical answer is that Comcast is not being honest. What, is $250 a month for TV and Internet not enough to be at least treated with respect??? As it happens last summer I spoke with a manager after getting the standard BS line and he told me that Comcast was planning a network upgrade that would increase HD capacity but it wouldn’t be ready until about June of this year. Well, its August and I see I can get WGN and KCSM in HD but still no Fox Soccer Channel. Why is Comcast not willing to answer honestly and openly? Look at the hottest thread on the customer forums, http://forums.comcast.com/t5/Channels-and-Programming/FSC-HD-Fox-Soccer-Channel/td-p/756830, over 400 posts from customers begging or telling of switching to a different provider and yet all Comcast Larry can say is he has brought the request to the team’s attention. Reading MC Seigler’s Netflix Original Content Is Much More Than A Strategy Shift — It Could Shift An Industry I thought again about cutting the cord. Our household is a very heavy consumer of cable content: soccer on Fox Soccer Channel, Gol TV and ESPN, movies and series on HBO, Showtime and Starz, original cable series on SyFy (though much less so than I would have expected if you asked 30 years ago! ), USA, FX, AMC and A&E plus the normal fare from the fivefour main over the air networks. Accordingly we pay Comcast a pretty hefty fee, adding on broadband internet to the above. North of $200 a month to be honest. What if we could just buy the broadband from Comcast and get the sports and entertainment content online, per Siegler’s post? That would mean paying the higher internet fee–somehow Comcast gets away with charging about $15 a month more if you don’t take both cable and internet. Wonder how soon I’ll really be able to do this. Networks, can you feel me? Pardon the Interruption but this ad is too weird! Seriously, what is up with the man’s photo in the ad? Maybe a marketing manager at LowerMyBills.com was drunk from a three martini lunch that afternoon or something. 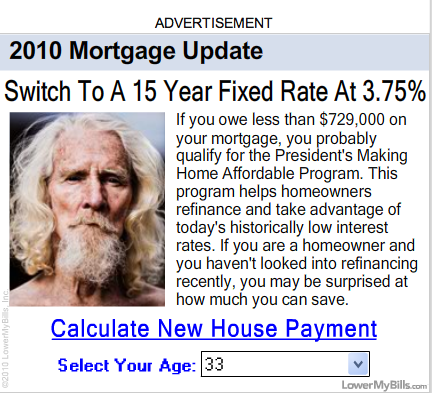 I’m not sure but the long, scraggly hair, unkempt beard and all around look of ‘my mind is somewhere but nowhere anyone else on Earth can go’ on his face do not make me scream “hey, let me go refinance the single largest investment in my life with these good folks!” Nor does his toplessness and potential nakedness for that matter. The only reason I came up with for using this image is that unlike 99% of ads I see online or otherwise at least I spent a few seconds thinking about this one. Not in anyway that’s good for the company but maybe this is the 2010 equivalent of the dancing silhouette I used to see often on Yahoo! ad network pages. Sorry but I am just not trusting that guy with my money. Do you know that Wells Fargo will take any reason to switch retail customers to online only statements? If there are two people on an account and one chooses online only statements and the other chooses online and paper (the only two options), Wells Fargo will force the account to be online only. Even though the other choose is more inclusive and customer-friendly. Customer are asked constantly, nearly every time one logs in to their online system, to switch to online only statements. I mean for years on and on. I guess its too much to think that answering a question once, or maybe twice, would be good enough. Forget about trying to get a straight answer from the customer service reps. I don’t blame the individuals, they’re only following instructions handed down from on high, but since customers can only speak with the front line reps I guess we’re stuck.